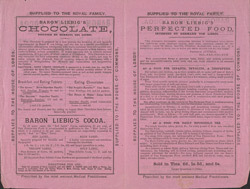 As well as developing his Beef Extract or Bovril as it is known today, Justus von Liebig also developed a cocoa powder and chocolate. Liebig is famous for talking about chocolate and this quote is very well known. "Chocolate is a perfect food, as wholesome as it is delicious, a beneficent restorer of exhausted power… it is the best friend of those engaged in literary pursuits."